The Caps beat the Senators on Saturday night in overtime at Verizon Center to give Dale Hunter the first win of his coaching career. 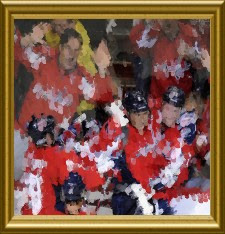 The Caps scored the game winning goal twelve seconds into the extra period on a nice pass from Jason Chimera to Brooks Laich giving them the 3-2 victory. Three is gonna be the magic number in order for the Caps to start winning some games. It was another physical game by the Caps who were knocking people over left and right for the 2nd straight game, which appears to be Dale Hunter style hockey. The Caps struck first in Period one on a nice shot by Nicky Backstrom. The Sens tied it up in the 2nd but it looked like the Caps were going to get the win after a Troy Brouwer score off of a nice Ovi pass in the 3rd. However, the Sens scored with under 4 minutes remaining to send the game into OT where the Caps took only twelve seconds to send the Verizon crowd into a frenzy. Games this week on Monday, Wednesday, & Friday, so a nice little week of hockey coming up including a matchup on Monday night against the division leading Panthers. I heard "lift check" mentioned a few times. What exactly is that? Is it a penalty to break someones stick? What if you do the same move but the stick doesn't break. Is that still a penalty? When the announcer says the ref has "washed out icing" that is because the puck was tipped or something right? Lift check = using your stick to lift an opponent's stick and prevent him from playing the puck. This is legal. If a legal check or a puck you shoot happens to break an opponent's stick, that is not a penalty. However, most broken sticks that are caused by a player's action (and not the stick breaking on its own from bad luck) are a result of slashing, a minor penalty. Slashing = swinging your stick in the air and hitting an opposing player and/or his stick. Icing can be washed out either because the puck was tipped, or because a defending player had a chance to play the puck before it crossed the goal line and didn't. 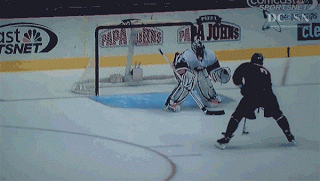 For example, the trick from NHL video games where you slow down and wait for the puck to cross the goal line before playing it does not work in real life. In real life, the linesman will "wash out" or "waive off" the icing if a player does that. Ok the icing thing makes sense now, I was pretty sure the puck wasn't tipped in the game, so that 2nd part is why it was washed out.